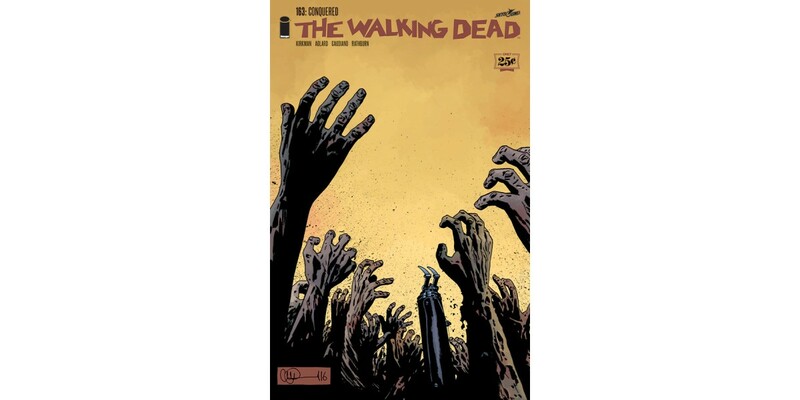 Image Comics partner and pop culture phenomenon Robert Kirkman and artist Charlie Adlard’s THE WALKING DEAD #163 is the Direct Market’s highest ordered comic in nearly 20 years. As final orders rolled in this week from Diamond Comic Distributors, THE WALKING DEAD #163 pre-orders exceeded 730,000 copies—without the aid of subscription box numbers to bolster the overall total—making the goal of expanding readership through a promotional 25¢ price point an overwhelming success. Coming on the heels of the bestselling “THE WHISPERER WAR” storyline, this issue marks the beginning of the “CONQUERED” story arc in the long-running blockbuster series and provides the perfect opportunity for discovery for new readers or fans of the hit AMC TV show to get hooked on the comic series. Image Comics enjoys a close relationship with the Direct Market comics retailers, often incorporating retailer feedback gained through always-open lines of communication, into the company’s overall sales approach. Rather than simply circulate marketing messaging to fans encouraging consumers visit their local comic shop, Image Comics’ 25¢ initiative—which begins with the special 40-page THE WALKING DEAD #163 and continues with INVINCIBLE #133 and OUTCAST BY KIRKMAN & AZACETA #25—is a definitive and quantifiable move to pay it forward to retailers who have long supported growing the creator-owned readership. The mission behind this promotion was not based solely on helping isolated titles gain a boost, but by increasing overall exposure through some of Image’s best-known titles. “The Direct Market helped make THE WALKING DEAD, INVINCIBLE, and OUTCAST the successful series they are today, and acknowledging that support is a big part of our agenda as Image turns 25 this year,” explained Kirkman. “Comic book stores have made it easier for us to accomplish everything we’ve done since our last anniversary, so giving back just makes sense, even though it means we’re not making a dime off these books.